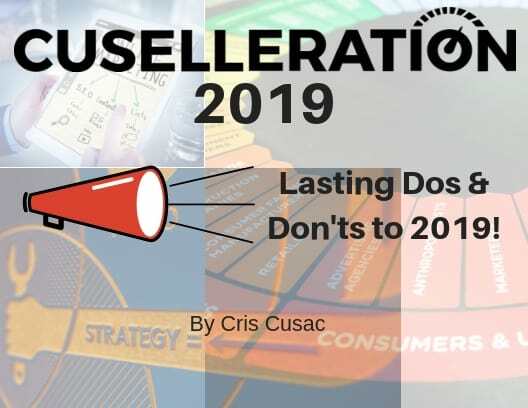 Cuselleration | Lasting Dos & Don’ts to 2019! 18 Jan Lasting Dos & Don’ts to 2019! 2018 was a great year for marketing. As an industry we are constantly improving and finding new and inventive ways to take our clients’ businesses to the next level. So, what is it that makes people successful in marketing or terrible at marketing? These Do’s and Don’ts might be a refresher for you, but if this is your first time seeing these, treat them as building blocks for your perfect marketing plan. Do: Continue to make relevant content for your preferred audience. There are so many companies out there trying to be #1. Be the best you can be. With all of the information out there writing an article or blog may seem like a drop in the bucket, but users in your sphere of influence will be able to see what you’re saying and will respond accordingly. Do: Stick with or revamp your branding. Branding is the means in which customers see you. You can look outdated, immature, sophomoric, trusting, loving, exciting, etc. Make sure you have a game plan. Know that you are your logo, your colors, and your mission statement. These are the things that people will see when they look at your business and make a decision on whether or not to work with you. Don’t: Change your goals or branding every month. Get a plan and ride it until it’s a winner, or in some cases until you have sufficient evidence that it is not working. One month isn’t long enough to make that judgement. Just because you haven’t reached your goal yet doesn’t mean you should give up. Branding is a long-term game and you need to commit yourself to it. Learn from your experience and get back up and try again. Don’t: Robodial. How is this still a thing? School is closed for the day? Great robocall, but trying to sell your product with a robot… (slaps face) We recommend taking an approach that doesn’t make people’s blood boil when they receive your call. Do: Pay for online advertising. There will be a don’t about this next, hold on. Most content needs to be boosted to receive the kind of attention you deserve. Getting your word out on social media platforms and search engines can be confusing and time consuming. The best time to learn where to run online ads and which ones get the best results is now! Don’t: Leave your ad unattended. Those are your babies. It’s a big internet out there and you want to make sure that your carefully crafted and worded ad is making an impact. It is not a set it and forget it type of marketing. Ad effectiveness can wear as your target audience is cycled through. Do: Take great photos. It a world that is ruled by screens, we have to make sure that what we write is first seen. Photos are usually attached to content to get a reader/consumer in. If you are not visually appealing how can anybody be expected to enjoy what your article is about. Don’t: Take bad video! Most social media has a way to filter you from news feeds. Don’t let one bad experience define a consumer’s image of you. Videos need to be entertaining and informative. Most people do not need 45 minutes of staring at your face while discussing any topic. Videos need to be short and to the point. Think of it this way, would you watch a 45-minute commercial on something that is not relevant to you? Make sure to keep the video short and simple when you’re not consulting a video expert. Do: Use experts. They are experts for a reason. Consult with a marketer, videographer, or developer to make sure your marketing has an impact. Yes, these services usually cost money but the worst disservice clients do to themselves is wasting their time and efforts doing it wrong. Don’t: Think you know better. As a marketer going on 10 years now, I have seen what people are capable of and frankly incapable of. Make sure you always get credible sources to agree with what you are doing. Internet marketing is too finicky to just leave half done. Do: Get Creative. Being creative is what marketing is all about. If you have an idea and think it will truly bring wanted value to your customers and not go against your current branding, then do it. I hope you were able to come out with a little knowledge. Please feel free to contact me if an update or change needs to be made. Cris Cusac at cris@cuselleration.com.